It was a Tuesday night, we had just finished dinner and put Thing One down to bed, and we’re just settling in to watch some ‘Homeland’ on tv when I got the message. It was a friend of mine asking if I knew why his MacBook was showing him a gray screen with a question mark on it when he booted it up. I informed him that the gray question mark screen means that the computer couldn’t find an operating system when it was booting up. That in itself isn’t the end of the world, but what he asked me next wasn’t going to have an answer he was going to like. If you’ve been around computers long enough, and are semi-technically savvy, you know that the dreaded clicking sound coming from a hard drive usually means that the hard drive is dead. The clicking happens with the little mechanical arm in the hard drive gets stuck and can’t move back and forth to read your data. It can happen for a number of reasons, but it’s bound to happen at some point in a non-SSD hard drive’s lifespan, it’s just the way it is. Your hard drive will fail at some point, it’s just a matter of when. I informed him that the hard drive was probably dead and that he would just have to buy another one and replace it in the computer, and reload the operating system. That’s when I could tell he was getting a little uneasy. He informed me that he had thousands of pictures of his kid on that hard drive that weren’t backed up to any sort of external hard drive or DVDs… which is the last thing you want to hear. Those pictures are priceless memories, and the fact was, they were probably gone forever now unless he wanted to pay a ridiculous amount of money to try and possibly recover the data, which isn’t even 100% guaranteed. And it’s not even necessarily that people choose not to backup their photos, it’s because a lot of them just don’t know how, or don’t know the best way to do so. So I wanted to write this post to help you guys out and make sure that you’re photos and videos are backed up safely for when that inevitable hard drive failure happens… because, like I said, it’s not a matter of ‘if’ it’s a matter of ‘when’. The word ‘cloud’ is thrown around a lot these days, and a lot of people have no clue what it means. Essentially the ‘cloud’ is just a cluster of servers filled with hard drives that are sitting in a climate controlled warehouse, storing data for you so it’s not taking up space on your devices. This data can then be retrieved at any time to your various devices using the internet. There are a ton of different cloud backup solutions out there, but these are the ones we recommend. This is by far the simplest way to backup all of your photos and videos… and it’s 100% free for most people. Google allows you to store an unlimited number of photos and videos on Google Photos as long as you allow them to slightly compress the photos, and you only store videos up to 1080P (so no 4K). For the majority of people, this will be totally fine. This is what I use and it’s what I’ve got my parents setup to use. The images will not be super compressed to the point where you won’t be able to print them, they just might not be able to be blown up to a large scale in the future if you re-download them. But let’s be honest, nobody really prints pictures these days, so it’s a moot point. Google Photos also allows you to automatically upload any photo or video you take on your phone, directly to your Google Photos account. This way you always know that your media is backed up in case something happens to your phone. In addition to uploading directly from your phone, you can use the desktop website and drag old photos into Google Photos and it will store them for you as well. We highly recommend you setup this option even if you plan to use a different option in conjunction with this. You will always know that your photos are safely backed up and you can access them at any time through the Google Photos app on your phone, tablet, or computer. Dropbox is another cloud service that a lot of people use to keep various files in sync across multiple devices. We use it at work as a very simple file server for our shared business files. It allows all of our employees to have access to the same files at the same time, without having to connect to a physical file server. 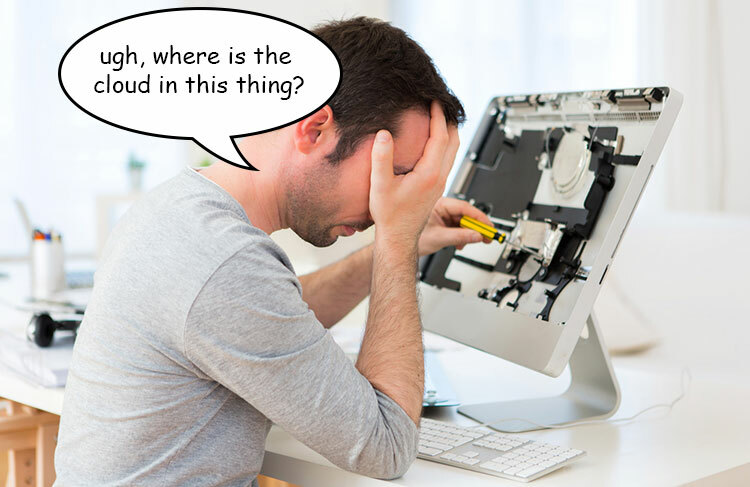 Obviously the only downside to this, as with any cloud service, is you always need internet access in order to sync files, but if you lose internet access you can still access all of the files that are currently on your computer. And this is why we like dropbox for image backup, especially from our phones. The Dropbox app on the phones allows you to automatically upload any image or video taken, directly to Dropbox, just the same as Google Photos does. However, those image files will then sync back to the other devices that you have setup to sync with your Dropbox, so the actual image files will be accessible elsewhere. So in my case my laptop also syncs with Dropbox, so the photos from my phone are instantly available on my computer to manipulate in Photoshop, or move over to my physical file server for backup. The images are also stored on Dropbox’s servers, so if something happens to your computer’s hard drive, you will still be able to pull all of those image files down from the cloud. The downside to Dropbox is that if you’re not a paying member, you only get 2GB of storage space for free. And with the size of today’s pictures and videos, that 2GB is going to fill up fast. But no worries, additional storage space isn’t too expensive at around $99 per year for 1TB of space. So if you want to be sure you can backup all of your files, we suggest upgrading to a paid package. iCloud is Apple’s cloud service that backs up your phone on a nightly basis. This service will backup your photos if you have that option turned on, but you will most likely need to pay for more storage space as the free tier won’t be large enough to backup your whole phone over time. The 50GB tier comes in at around .99 cents a month, which is extremely reasonable, and it will backup anything on your phone you tell it to. For those wishing to backup their photos locally, in their own home, these options are great for that. The only problem with these options is, again, hard drives will fail. So even though these are your backup hard drives, there’s a good chance that at some point these hard drives will fail as well. If you truly wish to have a backup against hard drive failure locally, your best bet is to have a NAS setup running in some sort of RAID configuration. It’s a little more complicated than the other options, but you will be semi-protected over a hard drive failure. This is the most basic way to backup your photos. Purchase a cheap external hard drive that has a lot of space (4TB is fairly cheap these days), and periodically drag all of your photos over to the hard drive, then put the hard drive away until the next time. This is the option that a lot of people choose, if they have a lot of images on their computer. You would still need to get all of your photos off of your phone and on to your computer so you could back the computer up to the external hard drive, so it’s not as convenient as some of the cloud based options. But, if you don’t want all of your pictures being seen by a cloud service, then this is the easiest way to create a local backup of your images. A NAS setup would be a step up from just an external hard drive, and would afford you the ability to easily add more space to your backup system in the future, if you needed to do so. There are plenty of different companies out there selling NAS devices that you can purchase. We’ve used the Netgear ReadyNAS solutions, but brands like Synology, Drobo, and QNAP are also great brands. If you’re a little more tech savvy, you can always build your own as well. A NAS is basically a bank of 2-8 hard drives (or more depending on how large you want to go), that connects directly into your network and allows for access to the files over the network from any device in your home. It’s essentially a file server for your home. Most NAS devices are also setup in some sort of RAID configuration, which allows for a single hard drive to fail without losing your data. If two hard drives fail, you’re out of luck, but if one drive fails you can simply replace it and not lose any of your data what so ever. Once you had the NAS setup, it would function very similar to an external hard drive, but with the added benefit of being safeguarded against a single hard drive failure (as long as the NAS in question is setup in some sort of RAID configuration). So Which Backup Option is Best for Me? Honestly, that is up to you to determine. In my eyes, the best and easiest option is to use Google Photos. It’s unlimited and free, and it’s super easy to setup. So at the very least, I would setup Google Photos and have it backup everything on my phone and computer, that way you know everything is in a safe place should your device crash or your hard drive fail. In addition to Google Photos, you can explore one of the other options if you deem it necessary. I personally like to save all of the full resolution, original, photo files, so I use Dropbox in conjunction with my NAS in order to back up all of my media locally, but if a NAS seems too complicated, an external hard drive will work just fine. If you have any questions about any of these options, please feel free to leave a comment and I’ll try to help you out the best I can.